Eleven months ago, he landed on the shores of America destroying everything in his path. 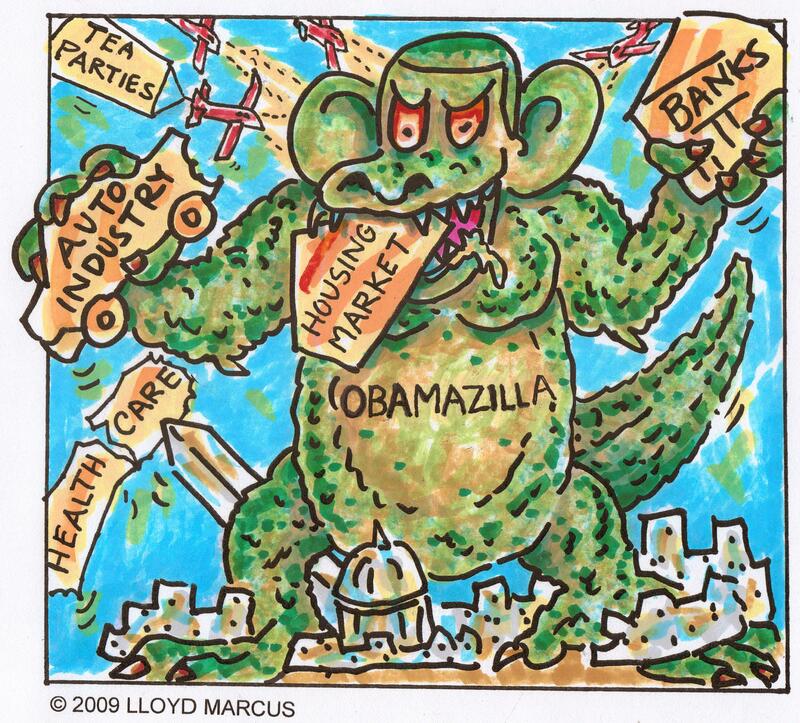 A gigantic fire breathing monster wreaking havoc, consuming private sector industries, crushing institutions which have made America great and destroying lives. With fear and trembling we dare to utter his name...Obamazilla! Though appearing indestructible and unstoppable, millions of brave patriots arose to challenge the beast; vowing not to sit idly by as America as we know it is terminated. As a patriot, I am totally focused on defeating Obamazilla, America's true Nemesis. I will not allow myself to be side tracked into participating in Tea Party movement family feuds. We are blessed to have brilliant strong willed strategists on our side who think they know which direction is best for the movement. That is fine. However, it is unfruitful and misdirected to boycott, trash and waste time and resources suing those on our side who have varying opinions. Nobody or organization can claim ownership or take credit for this amazing historical Tea Party movement. It belongs solely to We The People. It still blows my mind how without media support, but through on-line social networks and word of mouth, 1.7 million patriots showed up in Washington DC on 9-12 to oppose tyrannical government. Some have even attempted to force me to take sides. They threatened, "Lloyd, if you sing at their tea party, I will no longer be your fan." Unless a tea party group is wacko, while I may not totally agree with their approach, I consider them an ally. Again, my total focus is on the big picture, stopping the huge monster which is destroying our freedom, liberty and culture. Back in April, an upset California patriot emailed me after their successful tea party. His local organizers were gung-ho about fighting the battle on the national level. My emailer had a fire in his belly to fight locally. I advised my patriot brother to follow his passion. Our incredible movement was sparked by the passion of one man, Rick Santelli. What began with passion can only be sustained by passion, everyone doing what they feel passionate about doing. Besides, we need patriot freedom fighters in all areas and on all levels. Unfortunately, feuding over strategies has become a major distraction in the tea party movement. No, I am not asking anyone to compromise their beliefs or ideas. Quite the opposite. Whatever way you and your group chooses to fight Obamazilla is fine with me. But do not feud with tea party patriots who disagree or do not share your passion. Remember, your target is Obamazilla. Like everyone else, I have opinions regarding the focus of the movement, but I will not allow my opinions to cause me to break fellowship with my fellow freedom fighters. For example. Some think the Tea Party movement should remain "pure" not supporting any political candidates. I disagree. We can tea party until the cows come home, but if we do not work to put true conservatives in office, we are simply making noise without achieving anything. Another source of contention in the movement is talk of a third political party. I believe a third party would insure the election of democrats. Remember how Ross Perot got Clinton elected? Having said that, you third party patriots, if you feel strongly about starting a third party, go for it. You will not get any flack from me. My efforts are targeted solely on stopping Obamazilla. I only ask that you graciously accept me not wearing your t-shirt. For crying out loud patriots, Obama has awarded a terrorist the same legal rights as an America citizen. Reid is muscling through Health Care. Cap and Trade is next on the agenda. In America, we have a "pay czar." The list of horrors grow daily; and we patriots are fighting amongst ourselves. Please stop it. 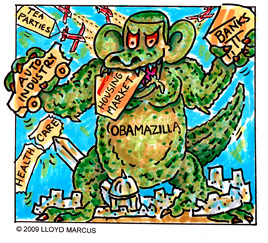 Stay focused on the real monster, the real enemy, the real threat to America, Obamazilla! The Tea Party movement has birthed countless grassroots organizations. It is truly a wonderful thing. I find it extremely exciting that patriots all over America are fighting to defeat this monster administration and restore our great nation in their own way. I met many of these committed patriots while traveling on the national Tea Party Express II tour. Conservatives from twenty something to eighty are running for office for the first time. Old ladies are bombarding their congressmen and senators with phone calls and letters. Everyone is doing their part. As corny and cliché as this sounds, it still holds true, "United we stand, divide we fall." Let's stand together brothers and sisters. Let's stand!